My translation of the opening of Christopher Ecker‘s compelling novella The Fourth Wound (Die vierte Kränkung is the original German title) has just appeared in the magazine Fras, no. 16. Set in Brittany during World War Two, it tells the unsettling tale of a non-combattant German living there in a state of increasing uncertainty – emotional, psychological, social and moral – and of the shadowy local figures he must reluctantly engage with. Its thriller elements remind me of John Buchan, and it draws eloquently on Breton myth, history and landscape. Christopher – who I met through the poet Arne Rautenberg, who I’ve also translated – lives in Kiel. His novel Madonna won the Book of the Year (Rheinland-Pflaz) in 2007, and his new novel, Fahlmann, has just been published. 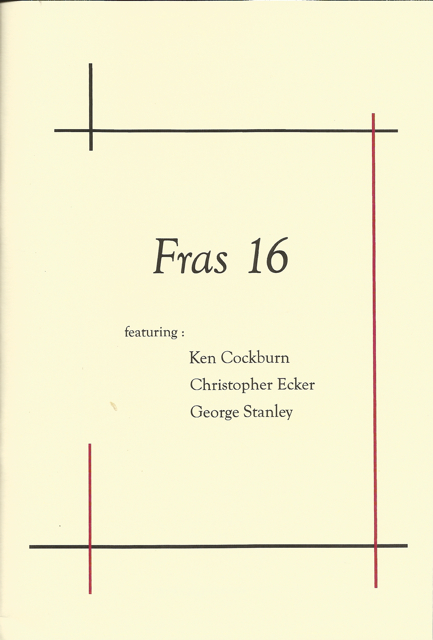 Copies of Fras 16 are available for £4 each from FRAS Publications, 10 Croft Place, Dunning PH2 0SB, Scotland, UK.